A number of readers were surprised by my change of recent change of view (see A rare “what’s my credit card limit” buy signal), I had been adopting a cautious tone since August (see Market top ahead? My inner investor turns cautious). The September to December decline had been highly ambiguous. I believed that unless I could pinpoint the reasoning behind the risk-off episode, it was impossible to call a market bottom. 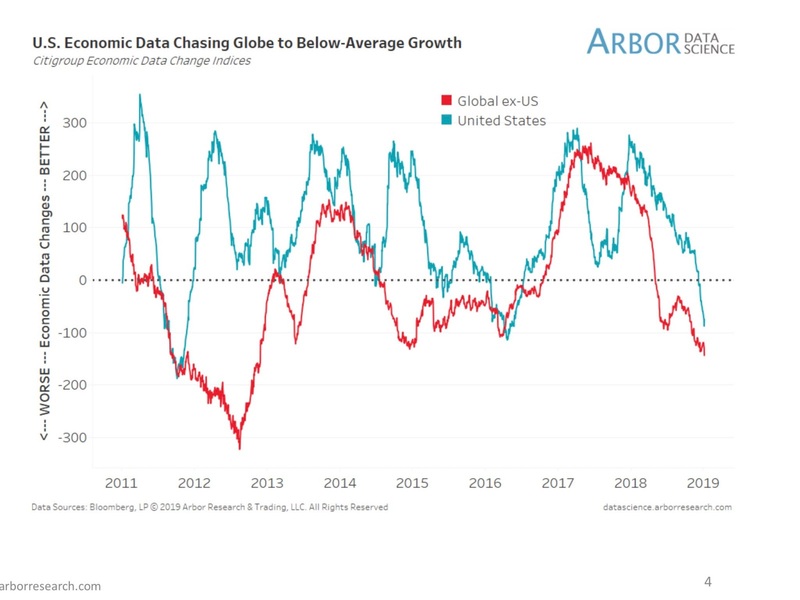 However, US equity prices had already fallen about 20% on a peak-to-trough basis, and the historical evidence indicates that such a decline is already discounting a mild recession. How much worse can it get? In addition, technical signals such as the Zweig Breadth Thrust (see A rare “what’s my credit card limit” buy signal) indicate that psychology is washed-out and turning around. The statistical odds favor high prices over a one-year time frame. That said, I stand by my assertion of a choppy market for the next few months. 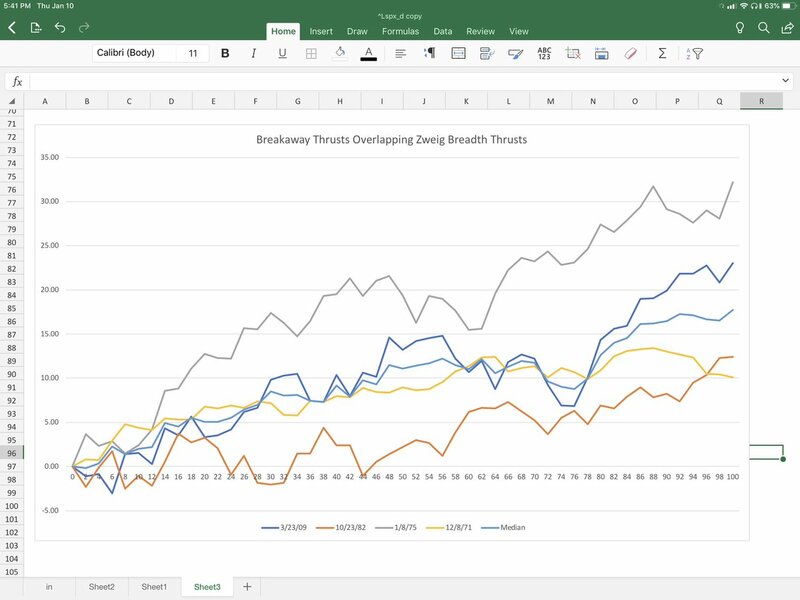 Even though the odds are in the bulls favor, key risks remain unresolved and they are likely to weigh on the market in the near term. Credit markets remain unsettled, and monetary policy could put downward pressure on stock prices. 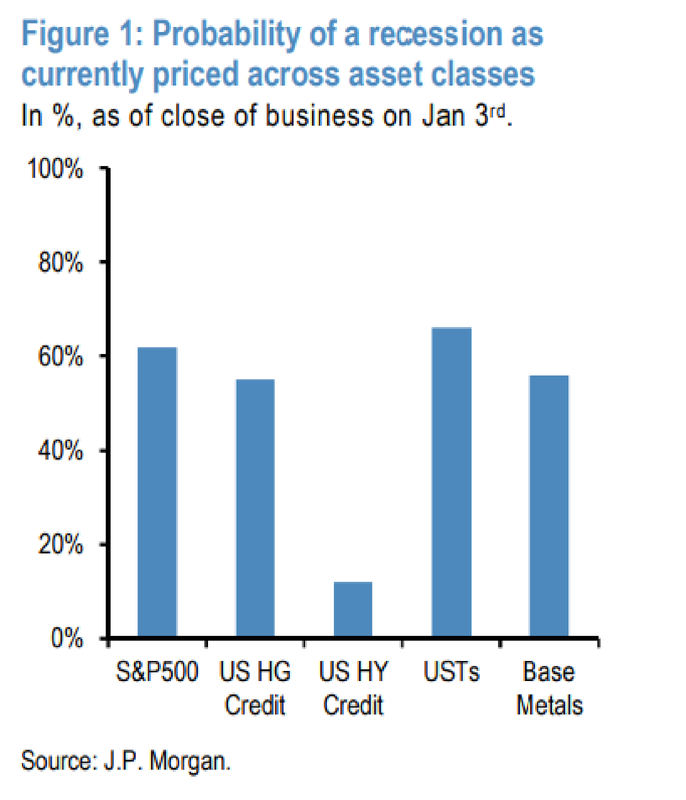 FT Alphaville reported that Nikolaos Panigirtzoglou at J.P. Morgan Securities calculated the recession probabilities embedded in different asset classes, and most asset classes were already pricing in recession odds of over 50%. As some recessions are shallower than others, Panigirtzoglou breaks down the historical data even further: deep versus mild. A deep recession is one in which the S&P 500 earnings fell by more than the median amount of bygone recessions — typically this occurs when the S&P 500 drops 33 per cent. A mild one is the reverse and an average slide of 18 per cent. Given this, Panigirtzoglou calculates that if a recession comes, the chances of it being a mild one sit at 88 per cent. With respect to earnings, a mild recession is already priced in. 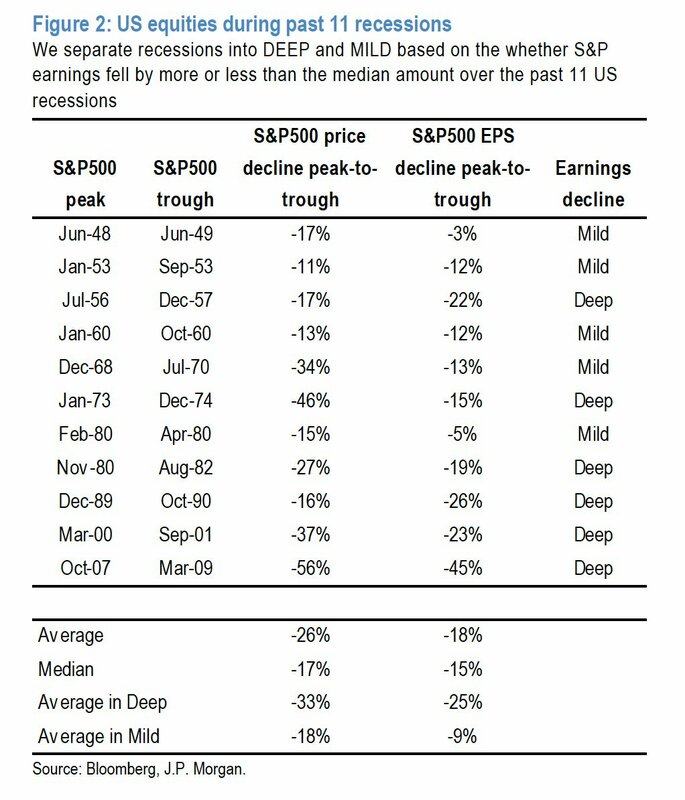 In the 11 recessions since 1948, S&P 500 earnings have fallen an average 18 per cent from their peak. Given that prices average 26 per cent, Panigirtzoglou reckons that earnings account for 70 per cent of the decline in equity prices during recessions. Therefore, with the 16 per cent slide in US equities since their peak, markets are already pricing in an 11 per cent decline in earnings — two percentage points more than what normally happens during a mild recession. The price action of the US equity market are pricing in a 16/18=88% chance of a mild recession or a 16/33=48% chance of a deep recession. How bad can expectations get? In order to be bearish, you would have to be betting on a deep recession and a catastrophic outcome. 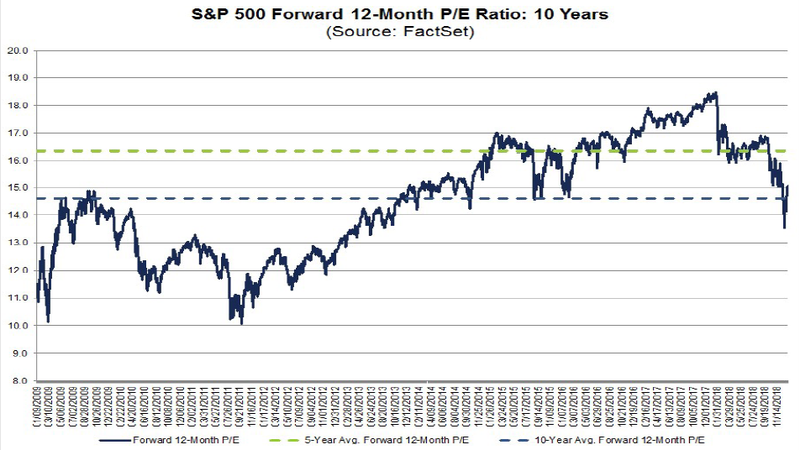 The latest update from FactSet shows that the market is trading at a forward P/E of 15x, which is slightly above its 10 year average. While the nowcast remains positive, there are changes in both the long and short leading forecasts. The bad news is that the short-term forecast (roughly through summer) moved from neutral to negative this week. The good news is that the long-term forecast, for the first time in many months, moved back to slightly positive. In summary, the stock market has valuation support. 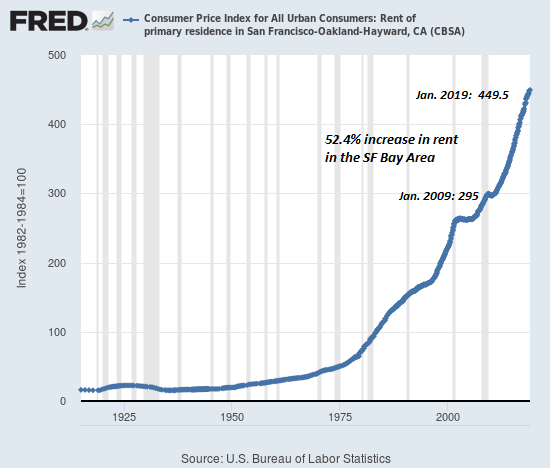 The market is moderately cheap, and it is already discounting a mild recession. The technical picture for stock prices is also constructive. The market has exhibited a number of breadth thrusts which indicate strong upward price momentum indicator bullish conviction. The Zweig Breadth Thrust is only one of many ways that the strong price momentum is showing up. SentimenTrader also observed two strong 90% up volume days within two weeks following 52-week lows have been strongly bullish. Wally Deemer also pointed out that the market recently experienced an episode of breakaway momentum. There have only been 11 such episodes in the last 40 years, and they have tended to be bullish. While the market never goes up in a straight line, the historical experience of the intersection of breakaway momentum and ZBTs have resolved themselves bullishly (x-axis = trading days, y-axis=% gains). In short, the market is enjoying valuation support and positive price momentum, which has historically been a bullish sign. What more could a bull ask for? However, some near-term risks remain. 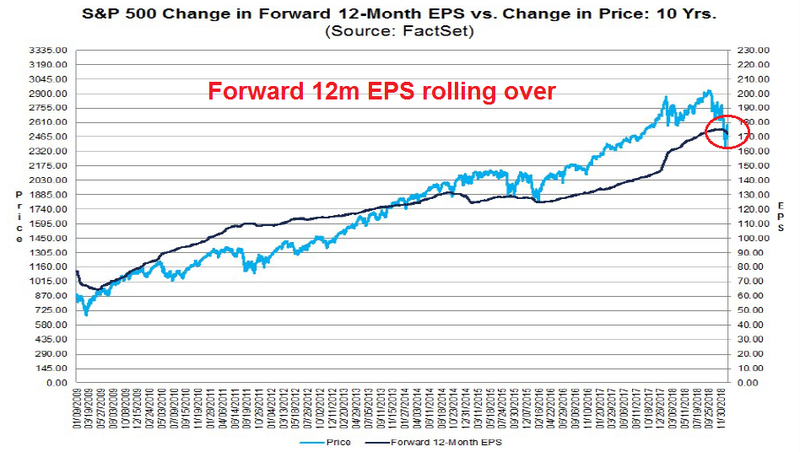 As we enter earnings season, estimate revisions have been falling, and stock prices have tended to move coincidentally with forward 12-month estimates. In addition, top-down data has been missing expectations, as evidenced by the falling Citigroup US Economic Surprise Index (ESI), as well as global non-US ESI. Regular readers know that commodity prices is a key input to my trend model. 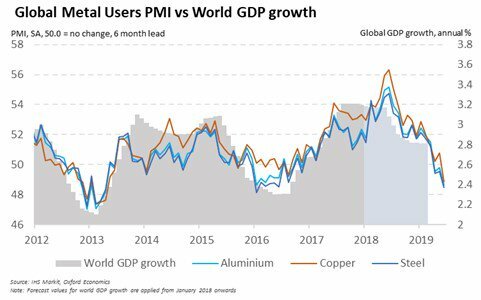 IHS Markit reports that its Global Metal Users PMI, which is a leading indicator of World GDP growth, is falling. In addition, the relative returns of global industrial stocks relative to MSCI All-Country World Index (ACWI) are tracing out a rounding top, indicating cyclical deceleration. The earnings guidance issued by S&P 500 companies for Q4 has been slightly more positive than average, while revenue guidance issued by S&P 500 companies for Q4 has been slightly more negative than average. China also poses a high degree of tail-risk for investors. 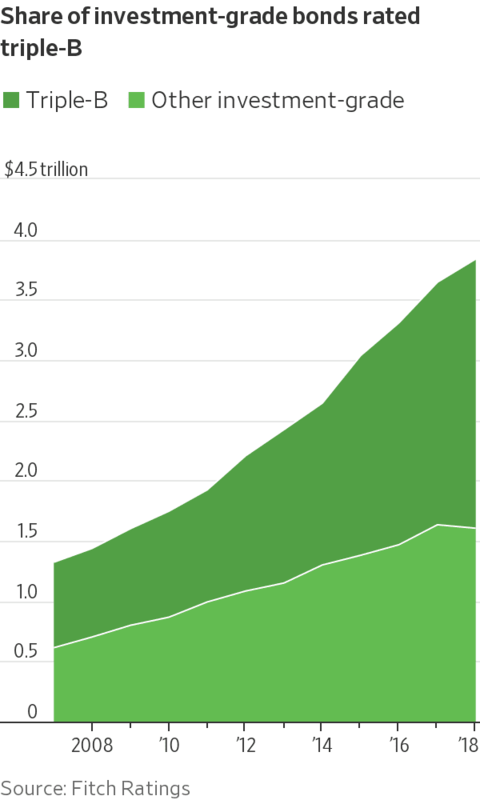 The Chinese economy accounted for roughly one-third of global growth and about half of global capital expenditures. 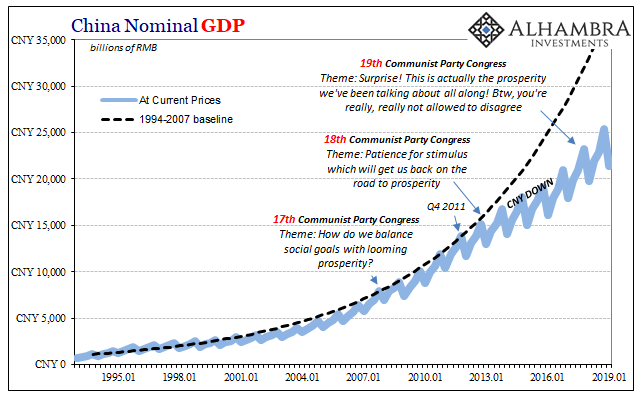 This is the China bear’s favorite chart, which indicates the precarious nature of her over-leveraged economy. In the past, Chinese debt has been less of a concern for global investors as most of it has been denominated in RMB, and therefore financial contagion risk is low. 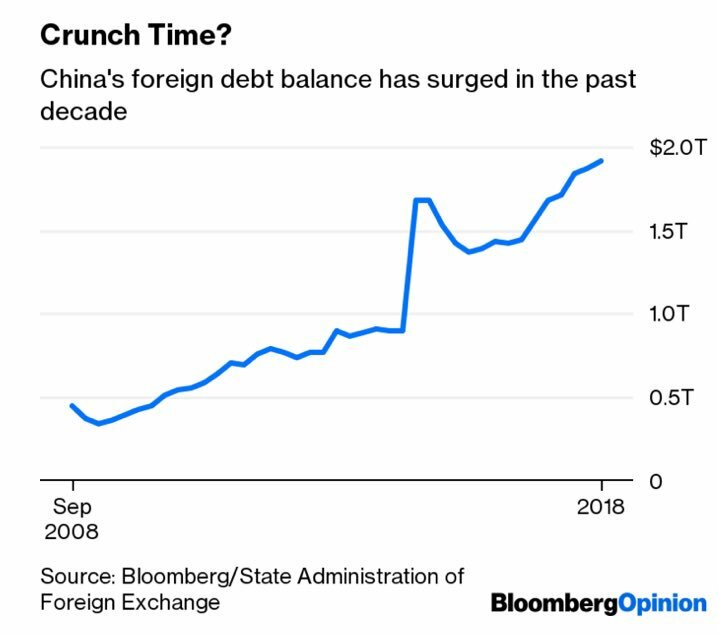 However, a Bloomberg article pointed out that external debt has ballooned to about USD 2 trillion, which is a significant level even in the context of China’s large foreign exchange reserves. Most export manufacturers in China have already moved or plan to shift some production outside the Chinese mainland, as the Sino-U.S. trade dispute adds to existing headwinds for businesses, a survey by Swiss investment bank UBS has showed. Thirty-seven percent of the respondents said they have moved some production out of the mainland in the past year, the bank said in a report released on Friday about the poll. Another 33% of respondents said they plan to do so in the next six to 12 months. China is buying American soybeans again and has cut tariffs on American cars. It is offering to keep its hands off valuable corporate secrets, while also allowing foreign investors into more industries than ever before. In addition, Beijing would roll back its retaliation for the first round of American tariffs. In addition, China is has offered some liberalization on investment in the auto and financial services sectors, and loosening of the JV requirement of forced technology transfers, though Beijing has long maintained it never forced technology transfer in the first place, and all deals were voluntary. In return, the US may or may not roll back tariffs levied on Chinese goods since the start of the trade war. That’s the easy deal. The difficult issue is an agreement on China’s industrial policy and IP transfer. US chief negotiator Robert Lightizer has pressed for a verification process of China’s commitments to Chinese concessions on these issues. Leland Miller of China Beige Book appeared on CNBC to state that he believes there is tremendous economic pressure on China to reach a deal, but it will be a deal in name only. In effect, the trade deal will amount to the “easy” deal (my words, not his), and possibly some provisions of the “difficult” deal, but the enforcement of the agreement will be a function of future US-China relations. In a past CNBC appearance, Miller explained that US-China trade frictions will rise in 2020. There is a growing consensus in Washington that China is a challenge for the US, and presidential candidates will all posture to show how tough they are on China. Even if we were to see a trade truce in 2019, friction is likely to rise next year. As the Democrats take control of the House of Representatives, the chairs of the various committees are expect to investigation both Trump, his family, and his cabinet. White House staff is preparing for a deluge of subpoenas as Democrats settle into their seats. In addition, the results of the Mueller probe is likely to become public some time in 2019. The combination of all these events are likely to put tremendous political pressure on Trump and how he governs. Unilateral declarations of emergency and martial law are what happens in emerging market countries under strongman rule. Most of these markets trade at single digit P/E ratios. Should Trump provoke a such a constitutional crisis, expect the markets to begin pricing in a political risk premium to the US equity market. Another source of risk comes from possible stress in the credit market. On the surface, conditions appear benign. 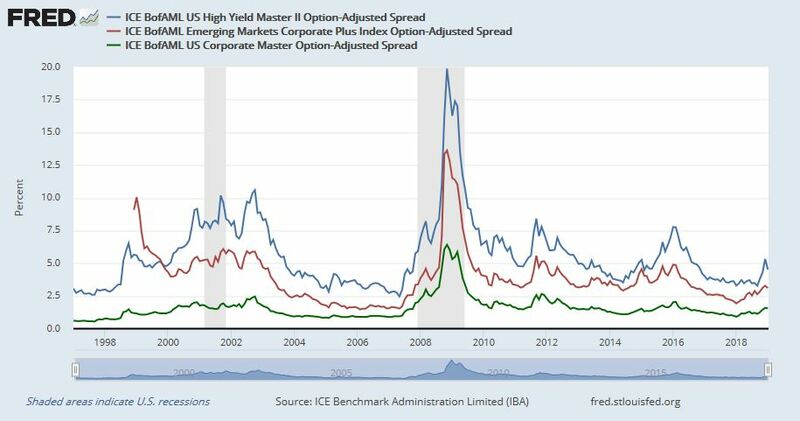 Credit spreads have widened and begun to normalize after the December risk-off episode, and levels are nowhere near the high stress readings seen in past recession. Beneath the surface, however, the internals appear ominous. 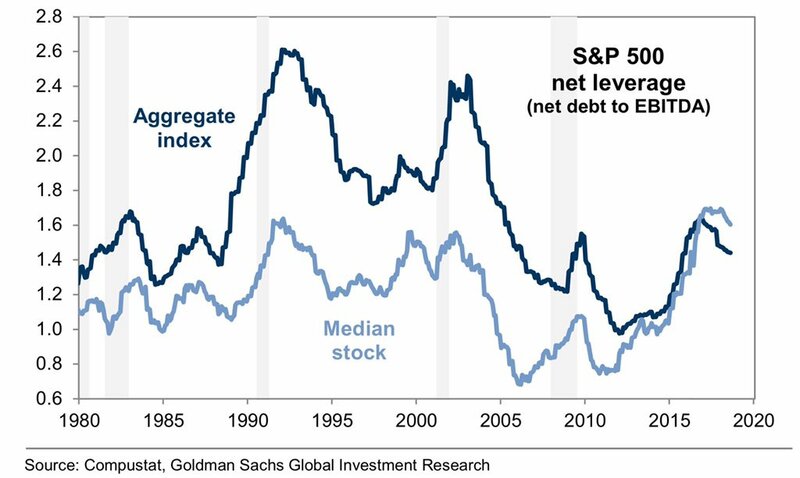 Median corporate leverage has returned to level equal to or above past market tops. BBB debt, which is the lowest level of investment grade credit, now dominate the IG bond universe. 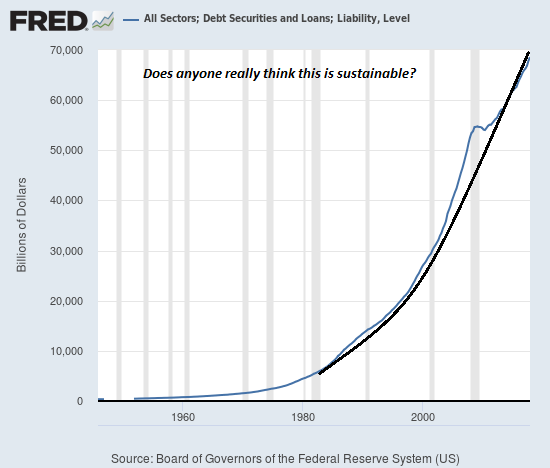 Should the economy weaken, expect many of the BBB credits to be downgraded to junk, which would flood the junk bond market with supply in an environment of uncertain demand. 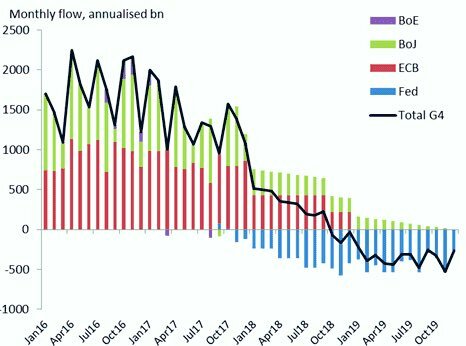 At the same time, global central banks are tightening and withdrawing liquidity from the financial system. Notwithstanding the Fed’s slightly more dovish tone, the Fed’s tightening bias will have a negative effect on the growth of the monetary base. 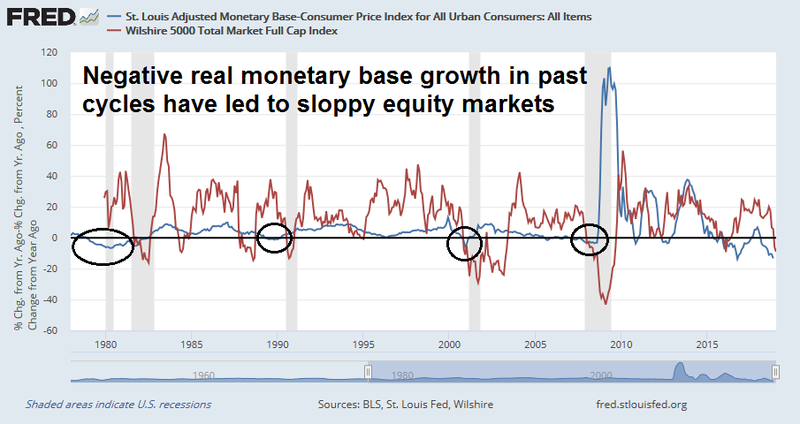 If history is any guide, negative growth in the monetary base has been a headwind to equity prices. To sum up, what does this all mean? My previous base case scenario had been a recession in late 2019 or early 2020, with a slowdown that begins in early 2019. Stock prices would decline, first to discount the effects of a slowdown, and later a recession. 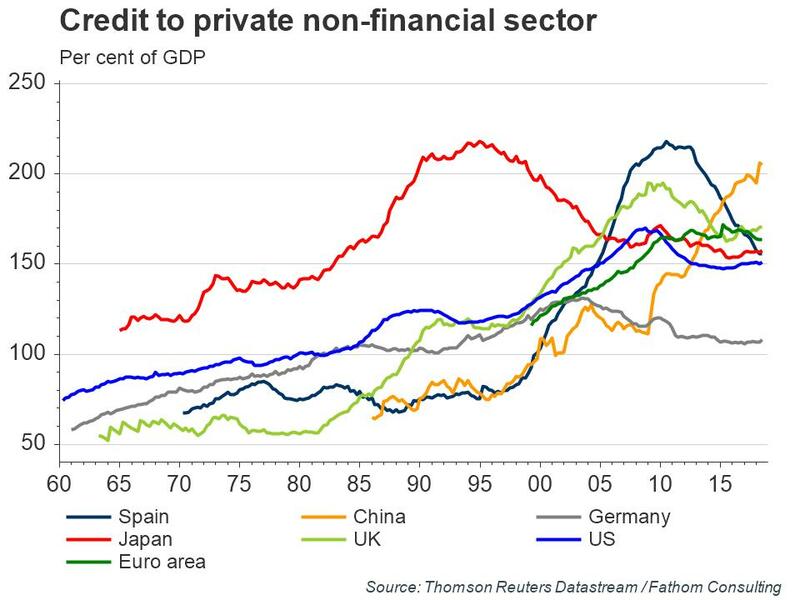 The recession would serve to unwind the excesses of the previous expansion, notably high leverage in China, and the unresolved banking problems in Europe. In reality, stock prices declined in Q4 2018 in a steep fashion, and the market is already discounting a mild recession. 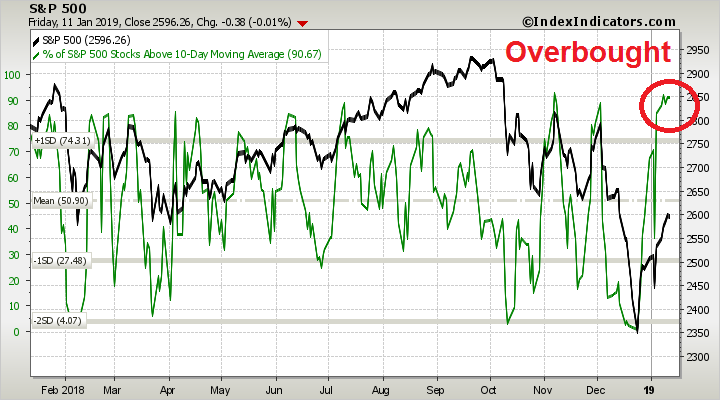 Technical conditions became washed-out, and different measures of breadth thrusts are pointing to an intermediate term bottom. While a number of risks remain, none of them, with the exception of a growth deceleration, will necessarily be realized in the next six months. It is also unclear how much of the growth slowdown is already discounted in the market. Real GDP growth fell from a 3-4% annualized pace in the latter half of 2018 to about 2% in 2019, which is well above recessionary conditions. 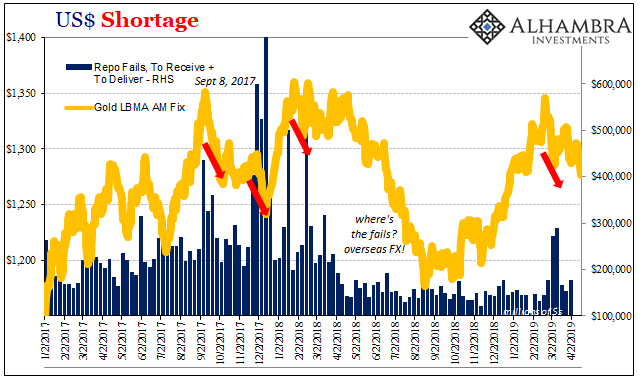 The other risks, namely China, trade war, political risk premium, and credit deterioration from monetary tightening may not fully manifest themselves over the next six months. Undoubtedly, the market will respond to news flow from these sources of risk in the future, but their near-term resolutions are unlikely to be catastrophic for stock prices. To be sure, the global economy is undergoing a tightening cycle. Callum Thomas has shown that tightening cycles, as proxied by the slope of the yield curve, tends to lead equity market volatility by 2 1/2 years. In conclusion, I had mainly focused on the risk conditions in the past, while ignoring valuation. Today, the combination of favorable valuation and positive momentum has changed my outlook. Based on these conditions, I would expect stock prices to grind upwards for the remainder of 2019, but in a volatile manner. 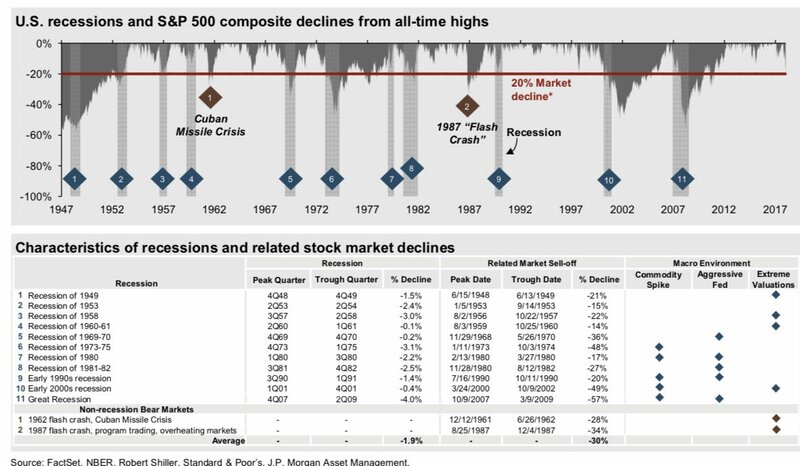 As the economy is likely to sidestep a recession, here are some possible historical patterns that the market might follow. These episodes all involved some kind of scare, but the market ultimately avoided a recession. 2011 was the year of the Greek Crisis in Europe, and a budget impasse in Washington. The market dropped, stabilized and chopped around for a few months, rallied, weakened and corrected, and then went on rise into fresh highs. 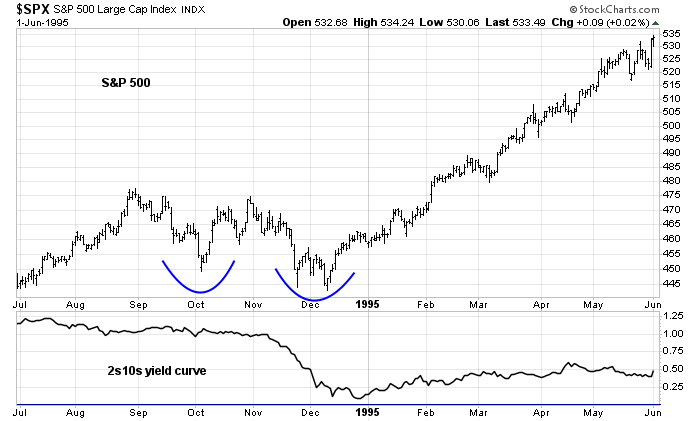 There was a growth scare at the end of 1994, when the yield curve neared inversion but did not do so. The market made a double bottom before going on to advance to new highs. 1962 was the year of the “Kennedy Slide”. 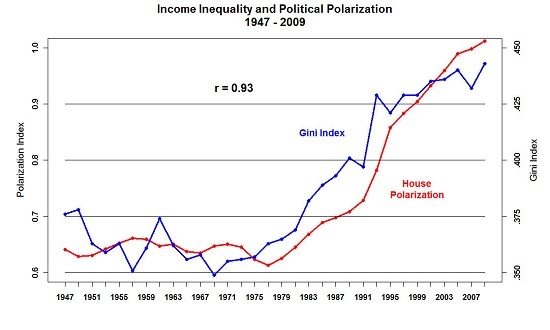 There was no recession but it was accompanied by JFK’s attack on the steel industry and a “businessman’s panic”. 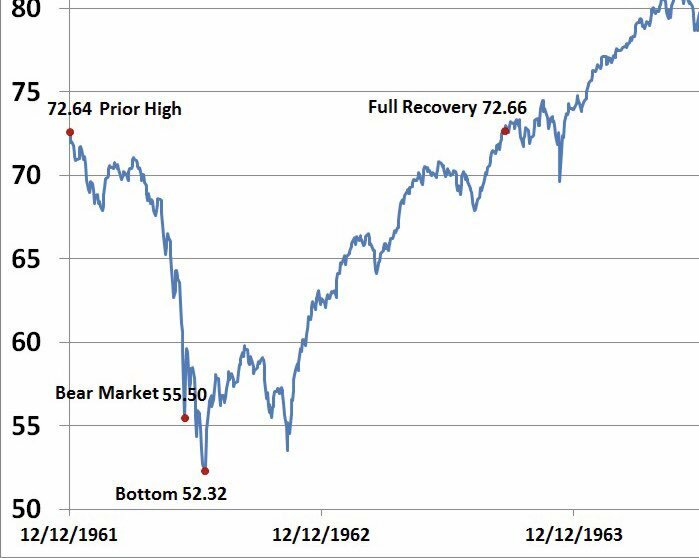 The market’s final bottom coincided with the Cuban Missile Crisis. From a technical perspective, the breadth thrusts were signals of the initial bottom is in, but to expect further volatility in the next few months. 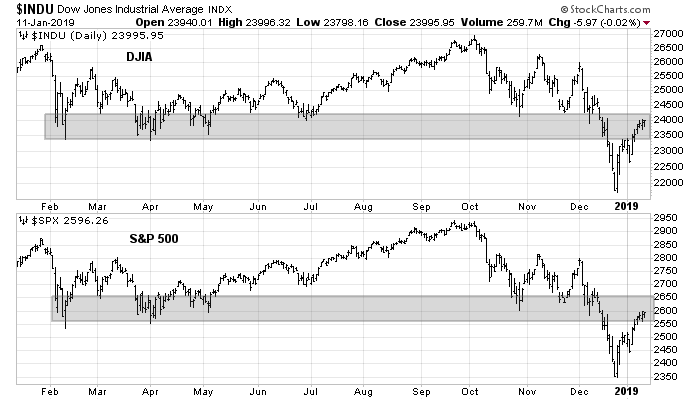 Don’t be surprised if the stock prices were to weaken again to test or undercut the December lows in a double or multiple bottom. Looking out 6-12 months, history tells us that returns should be positive. 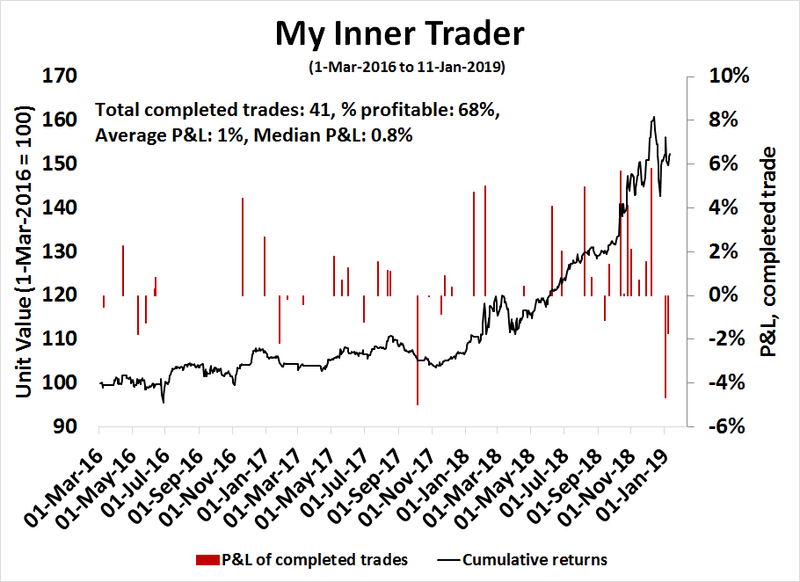 In light of my recent change in investment view, there have been a number of questions about the readings of different models. I will explain how each model is positioned, starting with the one with the longest horizon going to the shortest. The Ultimate Market Timing Model is an asset allocation model for investors with a long-term horizon. It was designed to avoid the worst of bear markets, and minimize unnecessary trading. Its recent sell signal was based on the combination of a recession forecast, and market action based on trend following models. This model will remain at a “sell” until the composite of global equity and commodity prices start moving above their moving averages. The slow reaction time of this model is a feature, not a bug. The Trend Model is based on, as stated above, a composite of global equity and commodity prices. Readings have shifted from highly negative to a weak neutral. Investors using this model for asset allocation should re-balance their portfolios from an underweight equity position back to their neutral target weights as specified by their investment policy statement. The Trading Model is the one with the shortest time horizon. Last week’s powerful Zweig Breadth Thrust signal moved this model from a “sell” to a “buy” signal. Over the next week, the market advance may start to stall as it has reached a key resistance zone. 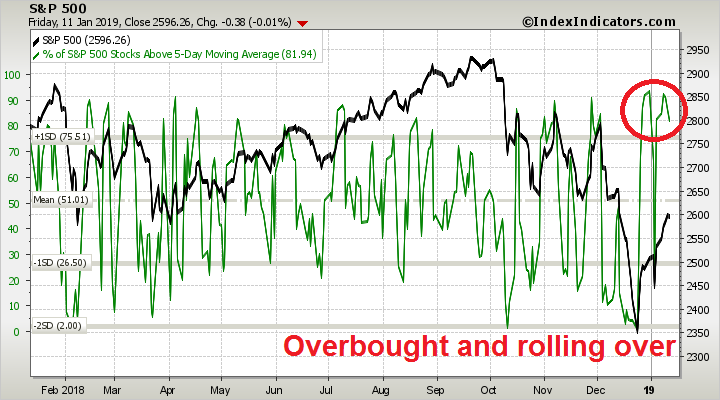 Short-term momentum (1-2 day horizon) is overbought and starting to roll over. Longer term (3-5 day horizon) momentum remains overbought, indicating possible downside risk. As well, the credit market`s rally stalled in the last two days of the week, while stock prices continued to grind upwards. 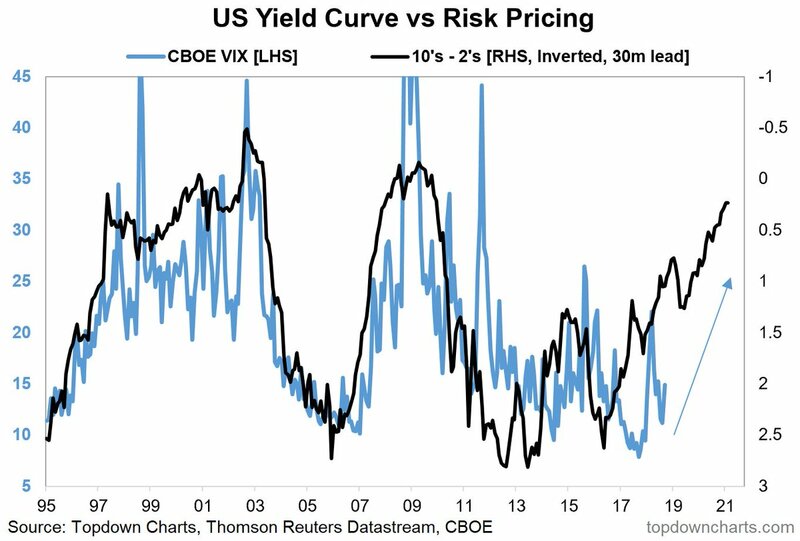 This is another sign that risk appetite is waning. In light of the unusual breadth thrust activity, it would be premature to turn overly bearish in the short-term. The market may pause and consolidate, or stage a minor pullback, under these circumstances. An upside breakout through the resistance zone would be highly bullish, and I am keeping an open mind as to short-term direction. Corrective action should be bought, and downside risk is likely to be restricted to only 1-2% in the coming week. Next A State of Emergency for the markets too?